Veggie stir fry is one of the easiest dishes to prepare. It takes only minutes to cook and is so tasty. Like my mom, I prefer to keep my veggie stir fry vegan. 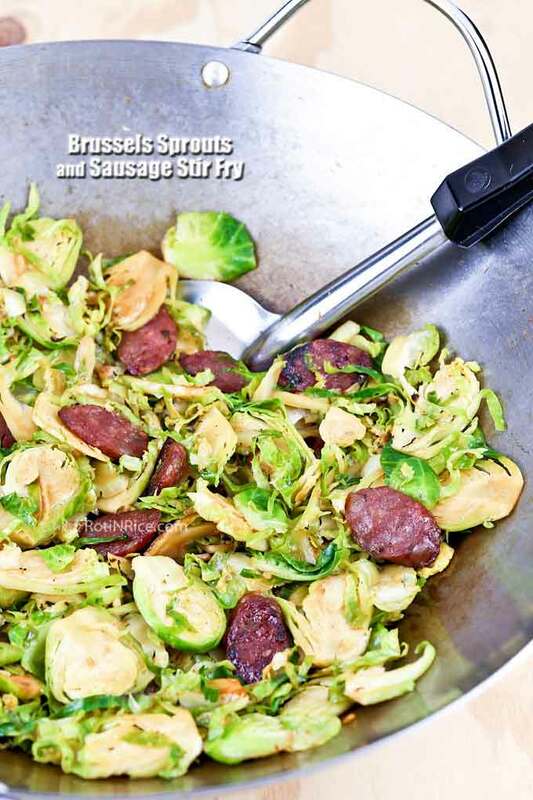 However, certain vegetables do taste better with a little meat or seafood to “sweeten” the dish and this Brussels Sprouts and Sausage Stir Fry is one of them. 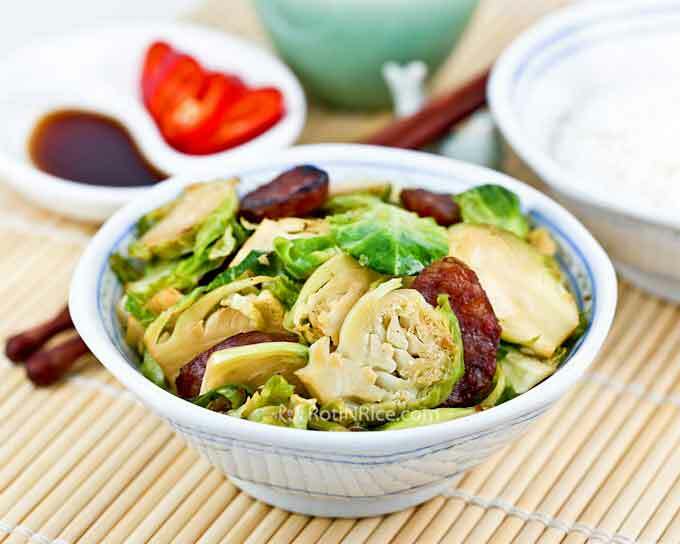 Brussels sprouts are very compact vegetables and do not hold as much liquid as compared to other leafy greens. They tend to be a little dry when stir fried on its own. A little animal fat helps make it smoother and tastier. 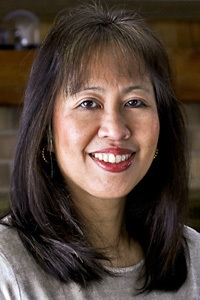 I like to use Chinese sausage but bacon or regular sausages will also work. Always remove the casing when using Chinese sausage. This can be done by soaking them in hot water. Once the casings puff up, they can be peeled off quite easily. 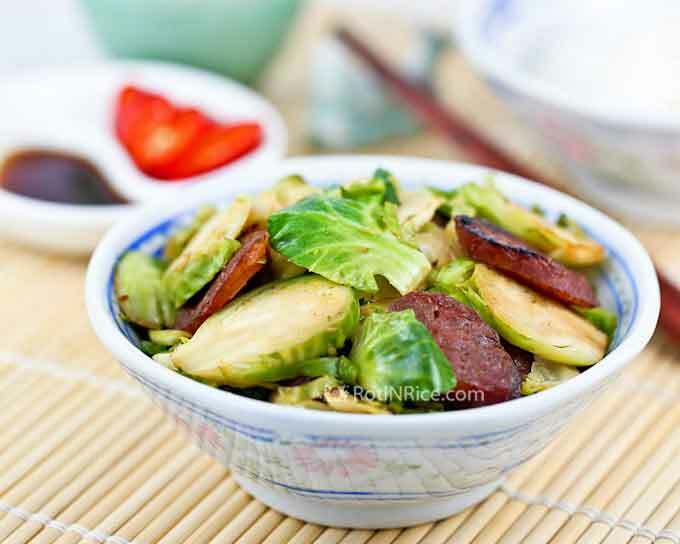 There is no need to use oil when frying Chinese sausage. Like bacon they render fat when cooked. Discard the oil if you prefer to use vegetable oil instead. Soak lap cheong sausage in a pan of hot water for about 10 minutes. Casings should puff up. Remove casings and slice at a diagonal. Wash and drain brussel sprouts. Cut off the tops and remove any bruised outer dark green leaves. Then slice each sprout thinly. Heat a wok or large pan. Fry lap cheong until lightly brown, about 2 minutes. There is no need to use any oil. Remove, leaving the oil in the wok. Set aside. Add vegetable oil. Sauté garlic for about 30 seconds. Add brussel sprouts, pepper, and soy sauce. Stir fry for about 4 to 5 minutes. Return lap cheong to the pan. Stir to get all ingredients well mixed. Turn off heat. 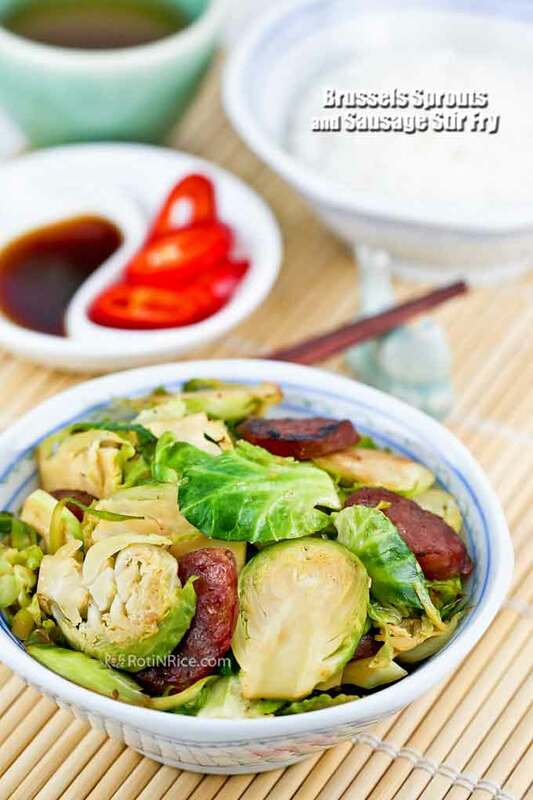 This tasty Brussels Sprouts and Sausage Stir Fry goes well with steamed rice but it is also be served with mashed potatoes. Do give it a try.